Ultrasonic in service inspections of primary and auxiliary circuits of pressurized water reactors are mainly performed with contact transducers. Such components may have a complex geometry and irregular state of surface, which leads to degraded defect detection and characterization performances. For irregular profiles, unmatched contact between the specimen and the wedge would occur (and vary according to the inspection position) thus resulting in a poor detection sensitivity and distortion of the ultrasonic beam. Smooth profiles variations, however, may also be hardly assessed if the beam axis is disoriented, which would obviously give rise to a mistaken defect localization. At last, the transducer scanning may be limited, and the scan area partially covered. To overcome such difficulties, a smart flexible phased array concept has been developed : the flexible radiating surface of the transducer allows to fit the inspected profile, while phased array techniques are used to preserve the ultrasonic beam characteristics through the whole inspection. A specific instrumentation inserted in the transducer housing allows to measure its own deformation and to compute optimised delay laws according to the profile. Experiments and modelling tests have been carried out in transmission mode to validate the transducer's ability to compensate the distortions encountered on various complex profiles. Other experiments in pulse-echo mode and beam-steering performed on an irregular profile specimen containing artificial reflectors show the defect detection and characterization efficiency of the system. The primary and secondary cooling systems of French pressurized water reactor comprise many welding components with complex geometry : elbows, buttwelds, nozzles. In service inspections of such components performed with conventional ultrasonic (UT) contact transducers present limited performances. First, variations in sensitivity, due to unmatched contact on depressions or irregular surface are observed, resulting in poor detection performances. In addition, the beam orientation transmitted through complex interfaces cannot be totally controlled, because of the disorientations suffered by the transducer during its displacement. As a result, the detected defect can not be correctly characterized, in terms of localization, geometry, orientation and size. At last, the geometry of some components, for example nozzles, disturbs the displacement of the transducer, resulting in an uncovered scan area. To overcome these difficulties and to improve the performances of such inspections, the French Atomic Energy Commission (C.E.A. ), supported by the safety authorities (IPSN) has proposed a new concept of phased array contact transducer. The phased array radiating surface is flexible to optimise the contact, and thus the sensitivity of the testing, while the characteristics of the transmitted beam (orientation and focal depth) are preserved during the scanning, thanks to a delay law optimising algorithm. This computation requires the actual position of the elements, thus a specific instrumentation is associated to the transducer to measure its radiating surface distortions. Those different stages of this system are described in the first part of this paper. Then, the model used to simulate the field transmitted by a flexible phased array contact transducer is presented. Finally, experimental results in transmission and pulse-echo modes are proposed. They validate the ability of this system to control the field transmitted through irregular interfaces, resulting in increased performances of the defects detection and characterization. The system relies on a specific phased array transducer and its related instrumentation and processing techniques, basically: a flexible phased array contact transducer and its radiating surface distortion measurement instrumentation, associated to a delay law optimising algorithm and a multi-channels acquisition system. 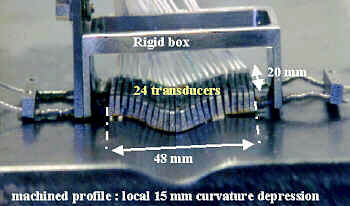 The transducer is composed of 24 rigid elementary ultrasonic transducers (elements), designed to ensure drastic distortions of the radiating surface, namely local concave or convex curvature radius of 15 mm. Those elements, mechanically assembled with cables and helical springs to obtain a jointed structure, form a "flexible" linear array of 48 * 20 mm dimensions (see Figure 1). The individual performances of each element, measured in pulse-echo mode show good reliability in sensitivity, central frequency, (about 2.5 MHz), and bandwidth, (about 50-60 %). Fig 1: Jointed transducer applied on a 15 mm local curvature radius. To control the transmitted beam with phased array techniques, the actual positions of each element have to be known. To this aim, a specific instrumentation using a microwave technology has been developed in collaboration with French "Ecole Supérieure d'Electricité". It is composed of two micro-wave antenna fixed on the rigid box of the transducer and modulated sensors placed on the back of a reduced number of elements. Using the modulated phased techniques , the distance separating all sensors from each antenna can be simultaneously measured thanks to frequency modulated signals, and the selected elements are localized by triangulation. A first microwave prototype has been realized and studied with a realistic mock-up of the transducer array design (see Figure 2). The validation of its performances in terms of resolution, reliability and acquisition rate is in progress. Usually, beam-forming and focusing techniques with phased array relies on geometrical assumptions : desired depth and deflection angle define the "geometrical focusing" point and the associated delay law is computed to ensure constructive interferences at this point. However, significant differences between "acoustical focusing" characteristics, measured on the transmitted beam, and "geometrical" ones, imposed by the delay law are observed. This behaviour, well known in the phased array techniques, results from the limited aperture of the transducer . To overcome this problem, a delay law optimising algorithm has been developed to control the transmitted beam . The ''F.A.U.S.T." (Focusing Adaptive UltraSonic Tomography) system has been developed for many years to perform standard and complex phased array techniques. This system allows to drive phased arrays transducers and related parameters (delays at transmission and reception, amplitude apodization and amplification gain, pulse width). Various acquisition procedures [4-8], including self-focusing and real-time parameters adjustment according to specific algorithms, have been validated with immersed transducers. This acquisition system, jointly used with the delay law algorithm, is assumed to be used for real-time inspection of complex geometry specimen with the smart flexible transducer. The CEA has developed the 'Champ-Sons' model that predicts the field transmitted by arbitrary transducers through complex specimen . The "arbitrary transducers" term stands for monolithic and phased array, of planar or focused surface (spherical, torical or Fermat surfaces), wedge coupled or used in immersion. The specimen may have a complex structure - isotropic or anisotropic, homogeneous or heterogeneous -, and complex shapes (canonical geometry or user-defined by CAD). This model has already been experimentally validated for several configurations of immersed inspection  and compared to other approximate or exact models . This model is derived from the classical Rayleigh integral to take account for transmission through arbitrary curved interfaces and propagating media. As a result, the elementary contribution of each point source has to be evaluated using a "pencil-like" description as an extension of Deschamps' formulation . The ultrasonic field is therefore derived from the integration of all elementary sources over the radiating surface of the transducer. Some specific developments had to be performed to deal with directly coupled contact transducers, to simulate the displacement generated in a solid by an acoustical source applied directly on its surface. This source can always be considered as a distribution of loading point forces. Among the several models, the selected one [13-15], is based on the reciprocity theorem , and it neglects Rayleigh waves and Head waves. It allows to simulate the field transmitted by a flexible phased array transducer applied on any component, taking into account the distortion of its radiating surface. Figure 3 below shows some modelling applications for the flexible array lying on a planar specimen, and a complex shape specimen (made of two 25 mm concave and convex radii). Beam profiles computed show the ultrasonic fields radiated without delays (top of the figure), with delays computed to generate 45° Longitudinal waves at 50 mm depth through the plane specimen (middle), and optimised delays to take into account the real shape of the components (bottom). Refracting angles (using adapted delay laws) and main lobe / grating lobe ratio are reported on the echodynamic curves. Fig 3: Modelling of ultrasonic fields radiated through a planar (left) and a complex (right) profile using different delay laws: Longitudinal beam profiles. Ultrasonic fields radiated through both profiles without delays (top of the figure) point out the profile geometry : plane wave fronts over the planar specimen (left), and distorted wave fronts over the complex specimen (right). The exact profile geometry hast to be taken into account to steer the beam, as observed on both beam profiles at the middle of the figure : the acoustic field radiated through the concave/convex profile using the delay law computed for the plane interface exhibits strong distortions (split into two beams of equal amplitude), whereas the optimised delay law allows to compensate theses effects (bottom, left), resulting in performances similar to those obtained through the plane interface. The instrumentation designed to measure the distortion of the radiating surface has not yet been associated to the jointed transducer. Preliminary tests have therefore been performed using several known complex profiles. The transducer elements positions have been computed using a model simulating the displacement of the flexible array over the inspected specimen. Optimised delay laws have been calculated for those various positions of the transducer. Experiments in transmission mode have been carried out to estimate the ability to compensate the ultrasonic phase aberrations caused by various profiles. Those experiments have also been compared to simulation results to validate the model. Figure 4 below shows some simulated and measured (with a 0° longitudinal wave probe) beam profiles for a planar profile and the previous concave/convex profile, with delays computed to generate +/- 45° longitudinal waves with a 40 mm focusing depth. The simulation and measurement depth is 40 mm below the surface. The grating lobe level and the focal width are reported on the echodynamic for each configuration. A good agreement between experimental and simulated results is observed (profile, depth, deflection angle). The characteristics of the focal area (position, orientation, width, amplitude) are well predicted. Only a low underestimation of the grating lobe level can be observed in the case of the concave/convex profile. Moreover, compared to a plane interface, the distortions of the transmitted focal beam remain acceptable although significant distortions suffered by the radiating surface. So, the maximal increase of the focal width is about 40%, and the maximal loss in sensitivity is about 3-4 dB. The maximal increase of the grating lobe level is about 3 dB. At last, concerning the actual focal beam orientation, the average discrepancy obtained with the optimised delay law is less than 2°. 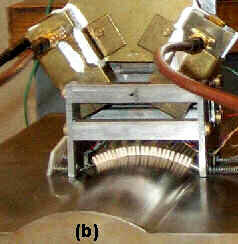 Experiments have been carried out in pulse echo mode on a specimen with a plane and an irregular profile, containing artificial embedded reflectors, with two different inspection procedures : a classical inspection using the transducer moved over the specimen, and beam-steering technique provided by delay laws, the transducer being fixed. The profile of the steel specimen comports two parts : a plane one and an irregular one, representative of a real component inspected on site. To have a performance reference, the same defects are embedded under the plane and the irregular interface. For both inspection techniques, two different focusing modes have been investigated. In the so-called "static focusing mode", the distortion of the radiating surface is not taken into account. In the "adaptive focusing mode", the actual positions of the elements are supposed to be known and the delay law is applied according to the profile. Inspection of 5.0 mm height tilted notches with 45° (L45) and 70° (L70) longitudinal waves have been performed, the smart flexible transducer being moved over the specimen. In this procedure, the "static focusing mode" means that the delay law referring to a plane interface has been applied through the whole scanning displacement, whereas, in the "adaptive focusing mode", optimised programmed delay laws computed according to the real profile have been successively applied to the transducer. The profile geometry and the inspection results with both focusing modes are shown in figure 6 below. Experimental results are "True Bscan" images, allowing to display echoes referring to the specimen spatial coordinates, as a function of depth and scanning position. Using the static focusing mode, the defect under the irregular profile is not detected. With the adaptive focusing mode the notch is detected, positioned and characterised. The inspection with L45 waves gives rise to two echoes: a diffraction echo (top of the notch) and a corner echo (reflection on the back wall and the notch), whereas the inspection with L70 waves allows to assess the tilted notches with specular reflection, thus giving rise to a single echo. This behaviour enables to identify the defect as a planar defect, whereas it could have been interpreted as two volumic defects using the single L45 inspection. Beam-steering techniques have also been investigated. In this inspection configuration, the transducer is fixed, and delay laws computed at various angles are successively applied to ensure a "sectorial scanning" of the specimen. This procedure has been achieved with two specific positions of the transducer : over the plane part of the specimen, and lying on the irregular part of the profile. Those positions, and the results are displayed on figure 7. These inspections have been carried out to estimate detection of two sets of 2 mm diameter side drilled holes located at 20, 30, 40 and 50 mm depth, under the planar profile and under the irregular profile. Delay laws have been computed to vary the beam orientation from 30 to 70°, with 0.5° step. In the "static mode", those delays have been calculated according to a plane interface, and applied for both positions of the array, whereas, in the "adaptive mode", delay laws have been calculated according to the real positions of the array. Fig 7: Beam-steering inspection of side drilled holes with two different focusing mode, the transducer lying on the plane part of the profile (left) and on the irregular part (right). Experimental results, displayed as "sectorial Bscan images", show that side drilled holes below the irregular profile cannot be correctly detected and accurately located with delay laws referring to the plane interface (see "Static mode" results). As already observed, the inspection technique must be able to compensate the distortion and disorientation of the ultrasonic beam. With the "adaptive mode" inspection, defect detection and localisation under the planar and the irregular profile are obtained with very similar performances. These experiments validate the ability of the system to improve detection, positioning, and characterisation of defects through irregular geometry specimen. A new concept of phased array contact transducer is proposed to improve the inspection of complex geometry components. Its radiating surface is flexible to optimise the coupling conditions between the transducer and degraded or complex profiles. Its phased array design coupled to calculated delay laws ensure the control of the transmitted beam characteristics. Experimental results obtained in transmission with a jointed transducer validate the mechanical and acoustical behaviour of this probe. The use of optimised delay law ensures the transmission of a homogeneous and controlled beam during the transducer displacement along complex geometry. The inspections achieved on a sample with a realistic irregular profile show the efficiency of the system to detect, locate, and characterise artificial notches. Experiments have been performed using different techniques : a "linear" scanning of the specimen, the transducer being moved over the complex profile with a controlled homogeneous beam preserved thanks to optimised delay laws, and a "sectorial" scanning of the specimen, the transducer being fixed and using varying inspection angles. This work demonstrates the capability of a flexible phased array contact probe to maintain the characteristics of the ultrasonic focused beam under an irregular profile. The complete system, including the micro-wave instrumentation, shall provide a full self-adaptive inspection tool. J. Ch. Bolomey, 'La méthode de diffusion modulée: une approche au relevé des cartes de champs micro-ondes en temps réel', l'onde électrique, 1982, vol 62, n°5, pages 73-78. M. El Amrani, 'Etude de différentes méthodes de focalisation ultrasonore appliquées au contrôle non destructif', Ph. Thesis, Université Paris 7, 1996. S. Chatillon, G. Cattiaux, M. Serre and O. Roy, Proc. of UI99'/WCU 99', published in Ultrasonics, 38, Vol 1-8 (Elsevier, 2000), p. 131. S. Mahaut, G. Cattiaux, O. Roy, and Ph. Benoist, Proc. of the 14th inter. Conf. on NDE in the nuclear and pressure vessel ind., (1996), p.427. S. Mahaut, G. Cattiaux, O. Roy, H. Acounis and G. Pincemaille, in Rev. of Prog. in QNDE, Vol. 15, eds. D.O. Thompson and D.E. Chimenti (Plenum Press, New-York,1996), p. 1931. S. Mahaut, G. Cattiaux, O. Roy, and Ph. Benoist, in Rev. of Prog. in QNDE, Vol 16B, op.cit., (1997), p. 2085. O. Roy, G. Pincemaille, PH. Morisseau, and P. Ancrenaz, Proc. of the 14th int. Conf. on NDE in the Nuc. and Press. Vessel Ind., (1996), p. 423. O. Roy, S. Mahaut, and M. Serre, in Rev. of Prog. in QNDE, Vol 18, op. cit., (1999), p. 2085. N. Gengembre and A. Lhémery, Proc. of UI99'/WCU 99', op. cit., p. 495. M. El Amrani, P. Calmon, O. Roy, D. Royer, and O. Casula, in Rev. of Prog. in QNDE, Vol. 14, op. cit, (1995), p. 1075. P. Calmon, A. Lhémery, and J. Nadal, in Rev. of Prog. in QNDE, Vol 15, op.cit. (1996), p. 1019. G.A. Deschamps, Proc. Of the IEEE, 60 (9), (1972), p. 1022. A. Lhémery, J. Acoust. Soc. Am., 96, (1994), p. 3776. A. Lhémery, J. Acoust. Soc. Am., 96, (1994), p. 3787. A. Lhémery and R. Stacey, in Rev. of Prog. in QNDE, Vol 14, op.cit. (1995), p. 997. K. Aki and P.G. Richard 'Quantitative Seismology - Theory and Experiments', Freeman Ed, San Francisco, 1980.